I was working on our video coverage of the 2018 CES with our resident videographer Jana Dagdagan, and as video is such a time sink, I wasn’t able to visit as many rooms as I usually do. But one room I managed to visit and that stood out when it came to sound quality was Constellation’s. Jon Iverson already blogged about this room, which featured the Revelation Series Pictor preamplifier and Taurus Stereo power amplifier driving Magico S3 Mk.2 loudspeakers, with the Roon Ready Cygnus Media player as a source, but I felt I had to note the sound in this room. 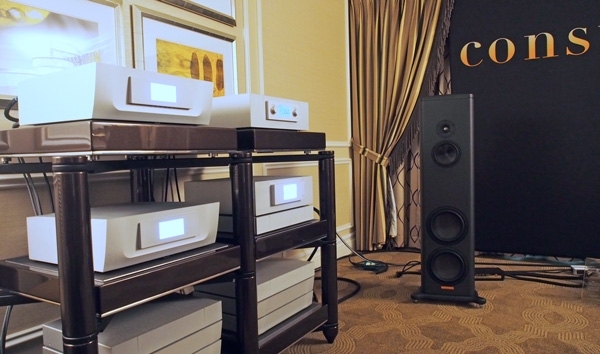 Cabling was all-MIT, with MIT Oracle MA-X balanced connections between preamp and power amplifier and with MIT’s new Heritage series 2C3D Level 1 speaker cables and MIT’s Z-Strip providing clean AC power. I played a hi-rez file of my so-far unreleased recording of the Portland State Chamber Choir performing Eric Whitacre’s Water Night and every detail of the complex, tone cluster-rich scoring was clearly revealed, yet without any unnatural spotlighting, and with superbly natural tone colors. I have been attending CES since 1979 and music-rich experiences like this are what keeps the show real for me. Larry Greenhill’s review of Constellation’s Inspiration Stereo 1.0 power amplifier will be published in the April issue of Stereophile.